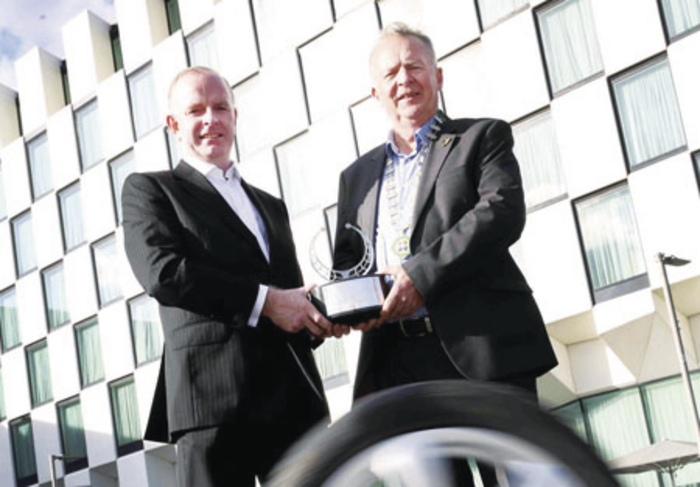 Tom Dennigan of Continental Tyres Ireland with Austin Shinnors, chairman of the IMWA, outside The Marker Hotel, Grand Canal Square, where the Continental Irish Car of the Year awards event will be held on Friday November 28. The 38th annual Continental Irish Car of the Year and Continental Irish Van of the Year will be revealed at a gala event in The Marker Hotel, Grand Canal Square, in Dublin on Friday November 28. •Alfa Romeo 4C, Audi S1, Audi A8, BMW i3, BMW X5, BMW 2 Series, BMW 2 Series Tourer, BMW X4, BMW M4, Citroen C1, Citroen Grand C4 Picasso, Citroen Cactus, Dacia Logan MCV, Ford Tourneo Connect, Ford EcoSport, Hyundai i10, Jaguar F-Type, Jeep Cherokee, Kia Soul, Lexus NX, Mazda3, Mercedes-Benz GLA, Mercedes-Benz S-Class, Mercedes-Benz C-Class, new Mini, Nissan Qashqai, Nissan X-Trail, Nissan Pulsar, Peugeot 308, Peugeot RCZ R, Renault Zoe, Renault Twingo, Seat Leon Cupra, Skoda Octavia RS, SsangYong Rexton, SsangYong Rodius, Subaru Impreza, Toyota Aygo, and the Volkswagen Golf SV. The voting members of the Irish Motoring Writers’ Association assess each vehicle, attributing points on the basis of criteria ranging from innovation and safety, to space, comfort, build quality, driving quality and value for money. “It has been heartening to see the uplift in car sales across the country this year and we can only hope that it is heralding a more general improvement in the country’s economic outlook. For anyone in that increasing number of motorists who is considering a new car with the 151 registration, the choices of the IMWA car jury will be a good guide in drawing up a list of ‘must try’ cars,” commented Tom Dennigan of Continental Tyres Ireland, Irish Car of the Year sponsor. A shortlist of vehicles will be announced in the coming weeks. Last year the Continental Irish Car of the Year title went to the Citroen C4 Picasso while the van accolade was won by the Mercedes-Benz Sprinter.